What is a 'Lippitt' Morgan? The following is a description of the Morgan from the 1952 Standard of Perfection and the 1959 Judging Standard. "The Morgan should have a fine, expressive head; well crested neck, coming out of the top of the shoulders, blending smoothly through the withers into the well sprung, deep body, with round rear quarter, which balances the front quarters. The whole structure should be heavily muscled and round, giving the impression of great substance and refinement, combined with strength and agility, grace and beauty." The neck should be of medium length, never long....(it) should be heavily crested; the stallion having a heavy rounded crest and the mare a fine knife-like crest. The throttle should be comparatively deep but clean cut." The withers should not be high and narrow....The crest and withers should blend together, with no depression on the topline in front of the withers." "The croup should be long, wide and slightly sloping." And Lastly: The Morgan is a small, compact horse. The height should range between 14.1 and 15.1 hands...the ideal is 14.3 hands and 1000 pounds. The best type is associated with the smaller individual. A Morgan over 15.1 usually lacks many of the breed characteristics." Morgan Movement"the horse who lets sunlight shine on the sole of his foot"
The "way of going" is a breed characteristic.
. Flight path of the forefoot has been described as following the arc of an imaginary wheel. The Morgan's upright neck, laid back shoulder, lon forearm, short cannon and his springlike pastern produce a round Morgan trot that surely is the result of his structure and bone angulation. The sloped shoulder produces reach...remember his forearm is longer than found in many other breeds. The Morgan is supposed to have short cannons and thus this helps to round the trot. With his erect head (note Hale's Green Mountain Morgan 42 on your registration papers) the trot produced will have lift to the stride. Add the flexion of the pastern and you get that Morgan trot. Old timers called Morgans "the horse who lets sunlight shine on the sole of his foot." Years ago there was great concern about the structure of the hind legs of show horses. Many had high croups, long weak backs and poor loins. They had examples in some of the judging tapes I saw. Good hocks in a Morgan come from a long femur bone with the stifle being forward of the hip. There is a definite angulation at the hock and therefore he flexes the joint fully with each stride. I am sure you have heard it said that the Morgan has "great driving force." Morgans are supposed to flex their hocks properly and move forward by swinging their hind legs from the hip. True Morgan movement is characteristic of this bred and should not be bred out. "Although he raised his feet but little, he never stumbled. In trotting his gait was low and smooth, and his step short and nervous;..."
"Morgan movement is just as characteristic as is his type. He moves the way he does because of the way he is built. Powerful muscles acting on the short bone structure of the limbs, produces the rapid, powerful, yet graceful and elegant movement. The ACCENT of the action is on the FLEXION of the PASTERNS, rather than the knees and hocks. The Morgan should move in a bold, fearless, animated, balanced and light manner. The stride is not long nor HIGH but extremely powerful and elastic. Having been nudged, cajoled, and hounded by a couple of Lippitt-loving ladies to set forth some of the tidbits I've come across in working out pedigrees and percentages of Morgan horses, especially Lippitts, I've come up with the following for the sake of my peace of mind. time, and except for 6 years there have been 30 or more each year since. In 1974 the number went over 40 for the first time though Vol. XIII does not list them all. There is a change that is taking place in the coloration of Lippitts that we should pay attention to. By far the most of registered Morgans are chestnut and the dominance seems to be increasing. In fact there are very many Morgans being registered that have un-Morganish colors, like palominos and duns. Even the prohibition against white Morgans came too late. I know of no duns or palominos among the Lippitts and there are none if the registrations are correct. Since bays, browns and blacks all have their color because of the presence of a "black" gene in contrast to a chestnut gene, let us call horse of these three colors, "colored," in order to contrast them in toto with chestnuts. Bays, browns, and blacks all have the black (dominant) gene, and differ in color because of the effect of another gene, a modifying gene, which alters the black to brown or bay. None of our Foundation Stock was black (a color some of you know I'm a bit partial to), nor were any brown. Of the 8 Foundation Stallions the split was even, 4 bays and 4 chestnuts (2 of these dark). Of the 17 Foundation Mares there were only 5 bays (1 very dark) but 12 chestnuts (3 dark and 1 a black chestnut which we must remind ourselves is a chestnut, not a black, if correctly labeled). Of the 888 Lippitts from Vol. II to Vol. XIII there were only 6 stallions and 11 mares that were black, less than 3%. The bays have numbered 123 stallions and 149 mares, while the chestnuts have 281 stallions and 294 mares. Colored Lippitts have then been 35.36% of the 888. This I think is a good deal higher than the percentage of total registered Morgans, but I haven't gone through the 43,518 horse to find out. Of the 40 or so offspring of Justin Morgan I have come across going through the Register, only 4 were known to be chestnut, 2 of these being rather famous ones, Woodbury and Sherman. 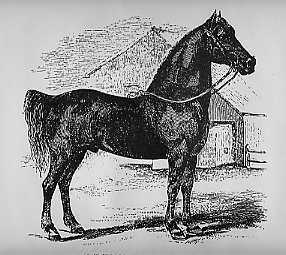 The Hawkins horse was black and one of his daughters was brown, as may also have been his son Revenge. The rest of those whose color is given are all bay. No wonder that among many people Morgan means bay. Now about percentages. I have written and article about percentages which I give to people who hire me to compute the percentage of their Morgans. Some of you have seen it, I guess. It tells among other things why there are such differences between different people's computations. What I give here are my computations which I will be glad to defend against anyone else's computations. 21 generations back a horse has over 4 million ancestors, however, and the magnitude of the task has kept the number of computers of percentages to a minimum, the number of accurate computers being of course smaller. That is not meant as a dig, only a caution about claims. The article also speaks of the reasons why percentages are important to the owner of a Morgan, though it is not unusual for people owning low percentage Morgans to scoff at them. The argument is a complex one, but I guess it can be summed up by saying that percentage is a measure of outcrossing, and what do you want, a Morgan or a Saddlebred? strength of Justin's blood, for such inbreeding of ordinary horse's offspring would soon have destroyed itself and no breed could result. It is difficult enough to get good produce from good stock; with bad stock it is hopeless. The horrible results gained from inbreeding many outcrossed Morgans is legendary and the reason why so many people not too knowledgeable about inbreeding are frightened of it. But one must always keep in mind that without homozygotic horses there is no breed, and without inbreeding there are no homozygotic horses. Even the Saddlebred outcrosses among the registered Morgans are becoming homozygotic, which is why some people talk of different kinds of Morgans. The Lippitt Club was of course formed only recently so all these statistics are in part a matter of back-tracking and there is therefore the possibility of misinterpreting things. But the people who have been the backbone of Lippitt breeding in the fairly distant past, the Knights, the Kelley's, the Rices, the Treftcs and the Hilts, to mention the biggest contributors, were doing the same things before the Club was even thought of. So I don't feel embarrassed about back-tracking. last Lippitts of less than 16% were registered in Vol.. XI. To get an idea of the relation between Lippitts and all other Morgans, if one has a horse of 18.75% (that's 3/16ths Justin Morgan) the horse is in the upper 24% of all 888 Lippitts, but in the upper 1/2 of 1% of all Morgans of the last 60 years or so. The average registered Morgan today seems to be somewhere around 11 or 12%, which means there are plenty with less than 9%, especially among western bred Morgans. For in the West non-Morgan mares were originally used to start Morgan herds by introducing Morgan stallions from the East which often already highly outcrossed. I have done the percentages of a thousand or so non-Lippitt Morgans so my statements cannot presume the accuracy of those regarding Lippitts, every one of which I have done. The following table showing the range of Lippitt percentage might be of interest to you. It shows the classic bell curve. breeders that we honor today who diluted the breed with outcrosses. It is the exception that wanted to keep the breed intact. This narrowing of our base brings me back to the point of our rate of growth. If we think that quantity is everything and that we must convert the world to Lippitts and so expand the market that we are pressed with producing more Lippitts, we may kill the goose that laid the golden egg. We few breeders are given a heavy responsibility. All that glitters is not gold, and not all high percentage Morgans are either good horses or good Morgans. What is important is to preserve the true Morgan, to cull out what is not, to choose stallions for the correction of our mares, and lot expansion come only if it is consistent with quality.